Help! My child is fat. What to do with childhood obesity? 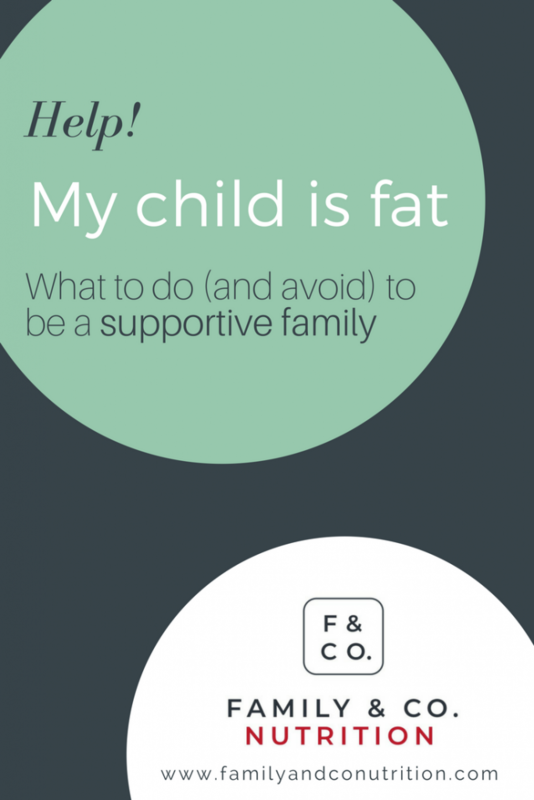 What to do (and avoid) if you feel that your child may be too fat. First, do not panic! We understand you to be completely lost, the headlines and even the public health experts repeat it none stop – Obesity is the great evil of the century. Obesity is on everyone’s mouth. Obesity this, obesity that… We’re constantly reminded that obesity is linked to such and such disease, that it’s pressing to lose weight (and keep it off) otherwise obesity is a condemnation. No wonder you’re freaked out if your child (or yourself!) is heavier than what people make us believe is the norm. Let’s take a deep breath, and face the facts. Obesity is not your child (or your) fault, and is not a sentence to die! Theoretically, childhood obesity is determined according to growth charts, which are based on population averages. You know, these curves where your family doctor indicates the weight and length of your child at each appointment. The World Health Organization defines it as “an abnormal or excessive accumulation of fat that poses a risk to health”. We ourselves have to reflect on our beliefs related to obesity. Often, we want to believe that the solution to obesity is easy, so we adopt the arguments that confirm our opinion. On top of that, what some people think they know about weight control has been “taught” to them by the weight loss industry… The weight loss industry has all the advertising money to tell us exactly what we want to believe: the body is malleable, the weight loss is accessible, and anything is possible with enough willpower … and our weight loss products! But let’s be lucid, it’s an industry that wants to see us fail and come back for more products. It doesn’t have our best interest in mind! Nobody can guarantee a weight loss. hormones, heredity, disease, gender, ethnicity, etc. anxiety, perfectionism, desire to please, low self-esteem, etc. eating and physical activity habits, culinary skills, erroneous beliefs, family dynamics, parents’ attitudes towards their own weight, etc. social norms of thinness and beauty, socio-economic status, type of work, peer pressure, etc. place of residence, access to healthy food, presence of elevators and escalators, lack of bike lane, portion size, ready-to-eat food offer, public policies, etc. In other words, although it is clear that weight gain results from excess energy in (food intake greater than energy burnt), the reasons for this surplus are multiple, synergistic and changing. On top of that, individual differences further complicate the picture. 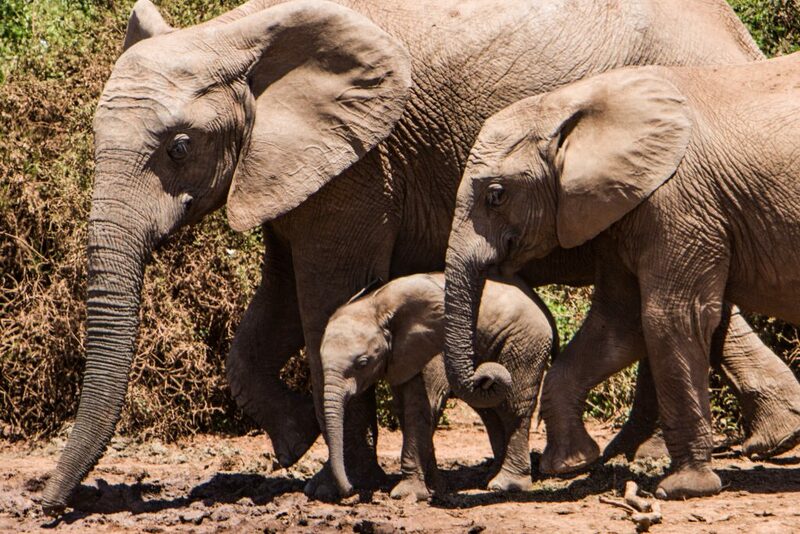 For a similar lifestyle, two children will not have the same body weight. Also, the fact that the rate of obesity is increasing around the world shows that the phenomenon largely exceeds people’s willpower. A multitude of factors influence body weight … the majority of which are not under your control. We want to believe that weight loss is accessible (and why do we want to believe it so much? ), that we’re ready to believe that obesity is the fault of the person with obesity… That it’s your child’s fault for eating too much, or your fault for not cooking balanced family meals every day. Because in the end, if people with obesity are responsible for their weight problem, that means they also have the possibility to change. They must simply choose not to change. They just must be lazy… As dietitians, our impression is that many people do not want to hear the truth, let alone believe it. Well, we have a good and a bad news. In return, the good news of not being able to control our weight is that it can induce a certain peace of mind? Knowing that we are not guilty, cowardly, lazy, stupid, unworthy…or anything that deserves to be blamed. Could knowing and accepting that fact lead us to let go, to stop the guilt, and to force us to consider another approach? We say yes. Hear us out. 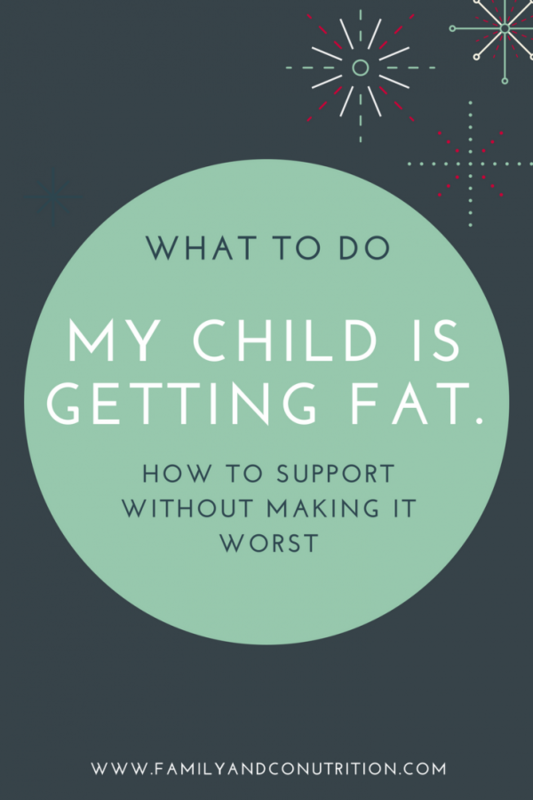 It’s a good news to know that you cannot control your and your child’s weight. Control involves authority, obligation, punishment, guilt. You know, all those things that we and kids hate! But the notion of control in health science is illusory and harmful because it denies the reality of unique individuals and the biological complexity that makes us alive. It also undermines real power by bringing guilt, shame, discouragement, too many “I must” and “I should have” thoughts. Let’s enter the era of power – the one that underlies possibility, capacity, permission, latitude, action. Because if we don’t have control over our child’s weight and many of its determinants, we have immense power over our behaviours. Our behaviours indirectly influence our family’s health and well being (and weight if you insist!). We have power over our behaviour, but no power over the consequences of our behaviour. We can take action by focusing on the immediate pleasure of doing it rather than being disappointed because our expectations are unrealistic. As soon as we adopt power over (inaccessible) control, it is no longer a question of stopping anything. It’s all about starting something new, something that we have the freedom to choose according to our desires, our tastes, our personality and our family reality. For example, you could choose to improve your diet for the sake of discovering new foods or cooking with your family, rather than having to skip breakfast because “I am so fat” and “it’s about time I take charge of myself”. One is an ability, the other is a punishment. And nobody likes punishment. If you don’t have control over anyone’s weight, the whole family has the power to act: to learn how to integrate new healthy habits, for pleasure and satisfaction! First, let’s start by saying that all treatments should always depend on an individualized and exhaustive professional evaluation. No single treatment is suitable for everyone. Also, if you believe that your child’s health is at stake, please visit a health care professional that will guide your family. That being said, you and your family can take action now. A starting point for the nutritional treatment of childhood obesity is ultimately quite simple: adopt a balanced diet. However, from your kids point of view, it is not so simple since they are not usually responsible for meals planning and shopping. That’s where it becomes a little more complex. The nutritional treatment of childhood obesity must be part of a family plan. The whole family must engage in healthy habits, and a balanced diet must become part of the family’s lifestyle. Not only will all of the family members benefit from these good habits, but doing otherwise would only isolate and stigmatize the child with excess weight. The child isolated could think it’s unfair (with reasons) and feel helpless and lonely, ultimately losing motivation and being depressed. 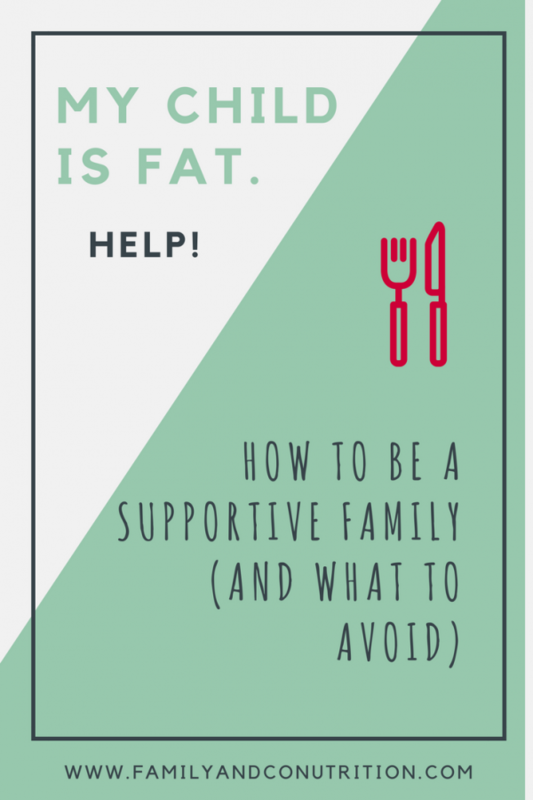 Besides, the whole family is encouraged to become involved, not to “support the child with obesity” but because acquiring good habits is desirable for all, regardless of their body weight. It goes without saying that to teach by example is always impactful. The nutritional treatment of childhood obesity must be part of a family plan, where everyone works together. Professional support may be recommended depending on the situation. If you think that professional help is needed, know that many professionals can help you in different ways: physicians, dietitians, psychologists, kinesiologists. And in that case, look for empathic and caring professionals. All family members should feel comfortable with their health team. Empathic and caring professionals with whom the family feels good can help support lifestyle changes that will last. Simple and concrete actions can be incorporated into your family routine now. The main goal is to choose what the family enjoys and which actions are likely to become a new habit. Let’s be realistic, a habit takes time to implement, so be kind to yourself! We suggest three simple ideas. Don’t hesitate to come up with your own modifications. 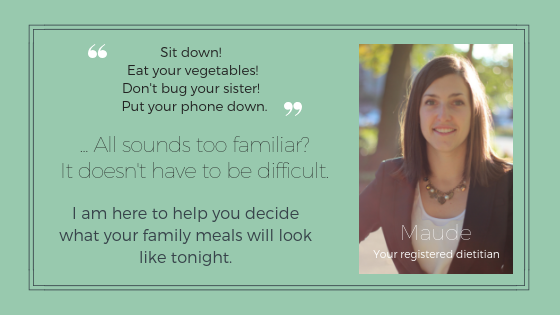 Try out different things as it’s the best way to find what works for your family! Involve your children to suggest ideas to improve your family health and to adopt a healthier lifestyle (you understand at this point that it is better to avoid presenting the idea as “the little one must lose weight”). Try to keep healthy snacks ready to eat. You could of course cook home-made muffins or granola bars, but if time (or inspiration) is lacking, you could start with fruits – preparing them in advance. We are talking here about washing grapes, cutting a pineapple or cantaloupe into bite-sized pieces, or washing strawberries. Another winning and easy solution is to have mixed nuts in the pantry, or pre-cut cheese pieces. The idea is to have simple, tasty and accessible solutions on hand for you and the children. An abundant food environment encourages us to eat more than necessary. 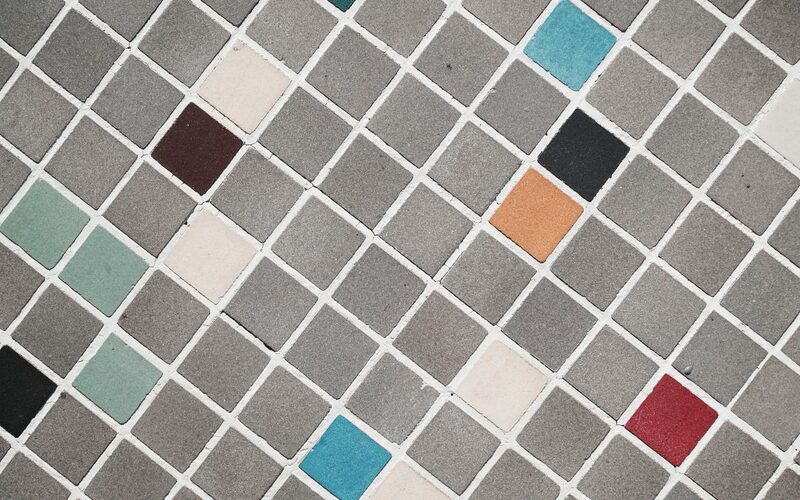 However, the line between not-at-all and way-too-much is sometimes blurry. Here are some ways to apply this principle. When cooking a meal including portions for next day’s lunch, put the lunch portions aside before serving the meal. This avoids having to say no to someone who asks for more (which could be associated with restriction). Nothing prevents them to eat something else if they are still hungry (yogurt, fruit, cheese, bread, etc.). But the simple fact that the serving dish plate is empty could be enough to realize (consciously or not) that in fact, they are not hungry anymore. Another example is to keep a limited number of temptation foods at home, such as cookies. When the one box of cookies is empty, it is done. No free-for-all, no restriction, there are just no cookies anymore! All of a sudden, the washed grapes are disappearing! And suddenly, a new habit is integrated, without effort and with pleasure … Because everybody knows that fruits taste like paradise! Health is good for everyone, regardless of the number on the scale. A child with excess weight (just like an adult, for that matter) doesn’t have to be marginalized, made feel guilty or be the only one to have to take extra care of himself. It is unfair and harmful for their mental and physical health. Stigma doesn’t motivate. Isolation is more likely to undermine the child’s self-esteem, leaving him feeling helpless, unworthy or rejected. Try to opt for inclusion and kindness. Involve the whole family and don’t isolate family members with obesity: health is good for everyone! You’ve just taken the first step! Caring for the health of your child and your family is a sign that you are a good parent! Keep in mind that incorporating new eating habits is good for everyone, no matter their weight. Creating new habits is an ongoing process, with lots of trial and error. The important thing is to go at your own pace and aim for improvement, not perfection. Improvement is accessible to everyone, perfection, to no one! Finally, if you believe that professional help might be useful, don’t hesitate to consult. Sometimes it can be the little kick needed to know how and where to start. Improvement is accessible to everyone, perfection, to no one!